Country roads, take me home, to the place where I belong…John Denver was singing about the mountains of West Virginia but his song resonated with me as I read about prominent Mumbaiites like Suketu Mehta urging the world to run to Mumbai – not away from it in response to the recent terrorist attacks. I agree with Suketu’s message and am trying to not give in to fear, to not feed into the goals of such heinous acts. So, inspired by another of Suketu’s writings, I wanted to share one of Mumbai’s most celebrated street foods, Vada Pav. 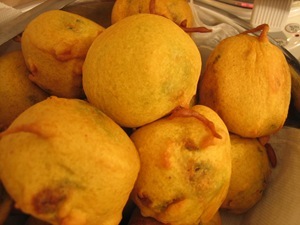 The stacks of pav have been sprinkled with chutney – the top half of the inside of the bun is bathed in green chutney, the bottom with red garlic chutney…I walk away from the stall and crush the vada by pressing down on it with the pav, little cracks appear in the crispy surface, and the vada oozes out its potato and pea mixture. I eat. The crispy batter, the mouthful of sweet-soft pav tempering the heat of the chutney, the spices of the vada mixture – dark with garam masala and studded with whole cloves of garlic that look like cashews – get masticated into a good mouthful, a good mouth-feel. My stomach is getting filled, and I feel like I am eating something nourishing a long spell of sobbing. This description has stuck with me ever since I read Maximum City months ago. It took about an hour for me, my brother, his wife, H, and R to make the vada pav (pronounced vuh-duh pow) but it was a lot of fun – from the rolling to the frying to the smearing the chutneys and then chowing down. Photos courtesy of my brother – deep frying and simultaneous picture taking not recommended. 1. 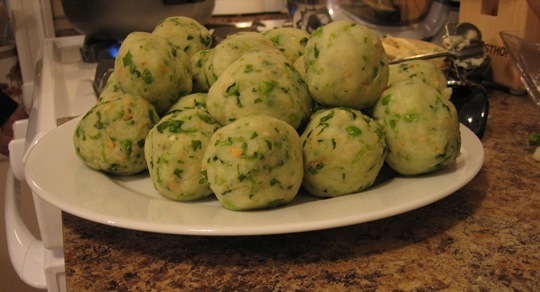 Vadas: Boil ~8 potatoes and 1 cup of frozen peas. Peel the potatoes andmash with the peas in a mixing bowl using a potato masher or a big spoon. 2.In a food processor, chop the garlic, green chilis, cashews and coriander and then mix into the potato-pea mixture. Mix in the garam masala, coriander powder and 2 tspn. salt. Break off portions of the mixture and roll in your palms into round balls. 3. Batter: Make the batter by mixing the besan slowly with ~1 cup water in a mixing bowl. The batter shouldn’t be watery or too thick. Mix in the turmeric, lal mirch and 1 tspn salt. 4. Heat enough oil for deep frying the vadas. Dip each vada into the batter and then gently roll into the oil for deep frying. 5. 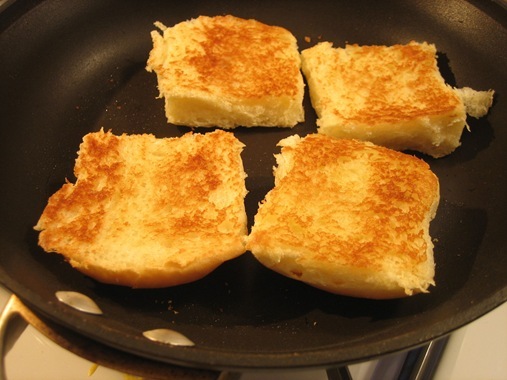 Pav: Spread Olivio on the insides of both halves of the buns. Pan fry each half until the insides are golden. 6. 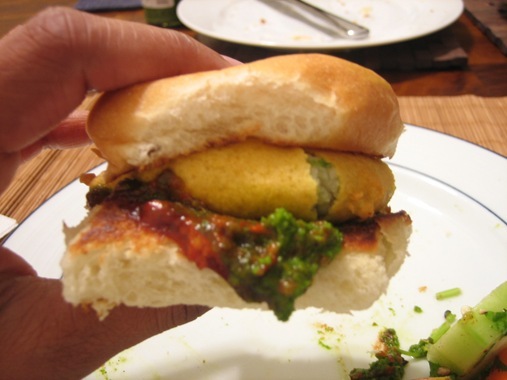 Vada + Pav: Smear mint, tamarind and chili garlic chutney on one side of the pav. Place the vada on top, then the other side of the pav and gently smush. Then, open your mouth wide and enjoy the “mouthful” – the “mouth-feel.” We put the chutneys out and then each assembled our own vada pavs – it’s more fun that way and let’s you choose how much chutney (i.e. heat) you can handle. This vada pav recipe was given to us by H’s mom with a little improvising on our part…like so many desi recipes passed down from parents, it was a list of ingredients without any measurements (b/c apparently parents don’t measure!). I wrote down the amounts we used as went along so here’s to another desi recipe being demystified. Also, here’s a post from Holy Cow, a vegan cooking blog, also about celebrating Mumbai and it’s beauties through it’s street food that I really liked. That looks absolutely fantastic! I really need to get over my whole “frying food scares me” issue. Erin, thanks! 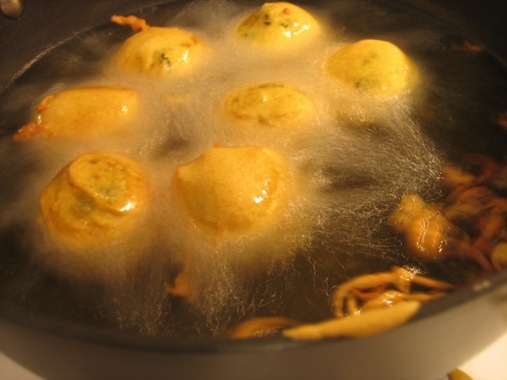 They live up to Suketu’s description so definitely a good reason for overcoming frying fears. I think the key is to keep the oil from getting hot and of course, being really really careful! Alisa, thanks for your compliments. That song has been stuck in my head ever since the weekend too! Looking forward to checking out your site. thank you, that’s an amazing picture, looks exactly like the vadapav at borkar’s that i ate. great site. i’m a hungry desi too. suketu, thanks for the compliments. i hope to one day make it to borkars…next up, maybe i’ll do masala cokes! Found you a Mike’s. Those vada pavs look WOW!! Good job done…they look really pro!! Thanks Deba! Happy to have found you and the Daily TIffin too. Let me know if you try the vada pav. Hi, I tried your vada pav recipe and i have to say, it was the same taste i had in Pune. It was amazing. We rae in Singapore and we were really craving for vada pav. Thanks a lot. It was too good. Could you also please post the recipe of the chilli garlic chutney which goes along with it. by ant chance do u have the recipe of Pav. Haag, sorry I bought my pav from the store 🙁 If you can’t find pav, you could try american hamburger buns (but they won’t have the mild sweetness that pav has. So jealous. I was thinking the other day that it’s about time to have these again. Thanks for the recipe. I was delighted to see the passage from Suketu Mehta’s book–I love the description of the vadapav in it, and I too, haven’t been able to stop thinking about it since! I’m definitely going to try this recipe soon.